These two albums are extraordinarily good. I know that seems deliberately ironic and clever but it's really, actually true. I used to think that I only loved them because they were the first things I really listened to. But I find that I keep listening to them, and finding things in them, and I'm realising that other people, real musicians whose opinions I respect think they're great too. 1. The song-writing is brilliant. Great tunes. Great arrangements. Little hooks everywhere. Lots of whistlable stuff. Lovely little lyrical moments. 2. The production is fantastic. It's got that late-70s meatiness, hints of glam and pub-rock, thick Chris Spedding guitar. But it doesn't just drone on. Lots of space and stops and starts, little vignettes, great use of orchestras and special effects for textures. 3. It's got top musicians, but they're restrained. Mike Batt himself is obviously an excellent musician, and he rounded up some great players for the albums. But because of the nature of the project there's no musicianly excess. No tedious solos, no showing off, everything's tight and constrained, like the best of The Carpenters. 4. The pastiches are brilliant. Better than that. Batt doesn't just do a country music parody with Wipe Those Womble Tears From Your Eyes or The Orinoco Kid. He writes a great country song. 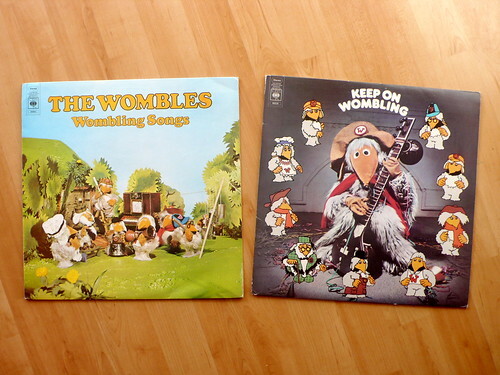 The Wombling Twist is great glam, rock-n-roll. Hall Of The Mountain Womble is like Concerto For Group & Orchestra but good, and short. It's a shame he didn't keep going longer, I would love to have heard Smells Like Womble Spirit, or Fear Of A Womble Planet. But the number one reason is the combination of great songs and brilliant world-building. The best bands are almost always fictional constructs. They make little myths out of themselves; through music, interviews and performance, the best bands have a story as well as music. And this gives them a constructed world their songs can spring from - meaning they can be about more than Boy Meets Girl, or can at least approach it in a different way. For The Smiths it was a literary melancholia. For ABC it was sarcastic glamour. For The Wombles it was the importance of tidying up. And 'tidying up' is such an original and strange place to start that you end up with really charming, fresh songs. Songs about things you've never imagined before; like Tobermory's Music Machine - a great tune, with lovely effects and ingenious mucking about with tempo. And Batt takes this stuff seriously, like everyone who writes well for children; he apparently spent a week in a Womble suit to get into the mood for song-writing. His conviction, and convincing world-building, makes something like Womble Of The Universe (Batt's Space Oddity) incredibly affecting.